While we no longer rent this product, we do carry the Zeiss Milvus ZF.2 85mm f/1.4. Additionally, you may find alternatives in the Recommended section on the left-hand side of this page. The Zeiss ZF.2 85mm f/1.4 for Nikon’s optical design produces high-quality, high-microcontrast, distortion-free images, even at full aperture. This lens features Zeiss T* anti-reflective coatings to help combat lens flare and ghosting. While this is a fully manually focusing lens, the camera will confirm focus just as accurately as it would with an autofocus lens. The camera body will also automatically control aperture and give accurate E-TTL flash-metering information. This lens’s shallow depth of field at wide apertures lets you use selective focusing to highlight your subject. An all-metal body and hood give the ZF.2 85mm f/1.4 a durable, premium feel. Its extremely smooth manual focus ring offers precision adjustment, which is assisted by an electronic focus-confirmation system. The ZF.2 designation adds a microchip to the lens that automatically lets the camera know time, aperture setting, and manual exposure settings, including those for cameras that are not AI-compatible. Since the lens now transmits the EXIF data, photographers no longer need to manually set the parameters. The ZF.2 lenses are optically identical to the original ZF lenses, so if these functions aren’t important to you, you can save some money by getting the original ZF mount. Full disclosure: I love Zeiss glass. I used to shoot it on the 1DsII with an adapter and still shoot ZF lenses on Nikon bodies pretty frequently. The ZF.2 lens is superbly well built with metal body and hood, and the smoothest focusing ring I’ve handled. The electronic autofocus confirmation system works: You focus the lens manually with the shutter button half-depressed and you get the ‘red box’ through the viewfinder confirming focus. Its fairly accurate, although I found it took a few minutes of practice to get used to it and live-view focusing is more accurate. Not as convenient or quick as motor driven autofocus, but better than unaided through-the-viewfinder manual focus. The 85 f/1.4 is not as sharp wide open as I’d hoped and I’d consider f/1.4 for emergency use only. By f/1.8 its sharp and at f/2.8 is wickedly sharp. As sharp as anything I’ve shot. My take is its sharpest in the mid range (from 7 to 50 feet) and not quite as sharp at infinity, which is what would be expected from a lens who’s primary use is protraiture and not landscape. Distortion is nil. The best part is it has that Zeiss ‘look’: great microcontrast, even when lighting conditions are harsh and contrast high. 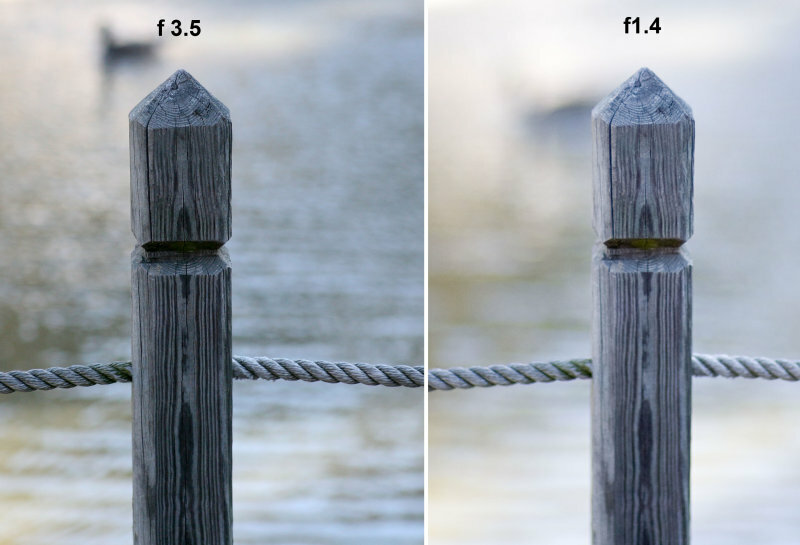 One other point that needs to be made: this lens does exhibit focus shift from f/1.4 to f/2 or so: in that aperture range it will tend to front focus, especially on objects fairly close to the camera. I know someone will ask this question, so no, its not ‘better’ than the Nikon 85 f/1.4. Its a slightly different look in contrast and color that I personally love, but probably not quite as sharp wide open and requires manual focus so its less convenient. It’s an excellent lens, but not my favorite among the Zeiss primes.